Banana flower are also called vazhaipoo in tamil. 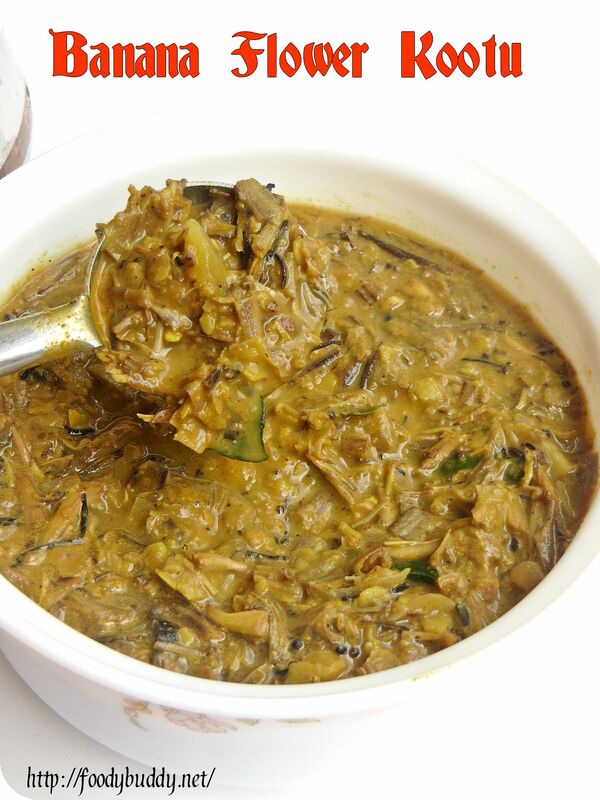 Vazhaipoo kootu recipe is a traditional tamil recipe prepared from plantain flowers. As vazhaipoo is very good for health, I used to buy regularly when I find them in market. I love to eat it any form either vazhaipoo vadai for mor kuzhambu or vazhaipoo poriyal or kuzhambu. To clean this vazhaipoo (banana flower) is a time consuming process but still worth it. I prepared this vazhaipoo kootu with moong dal, replace it with any dal of your choice. This banana flower kootu tastes fabulous with hot steamed rice and ghee. 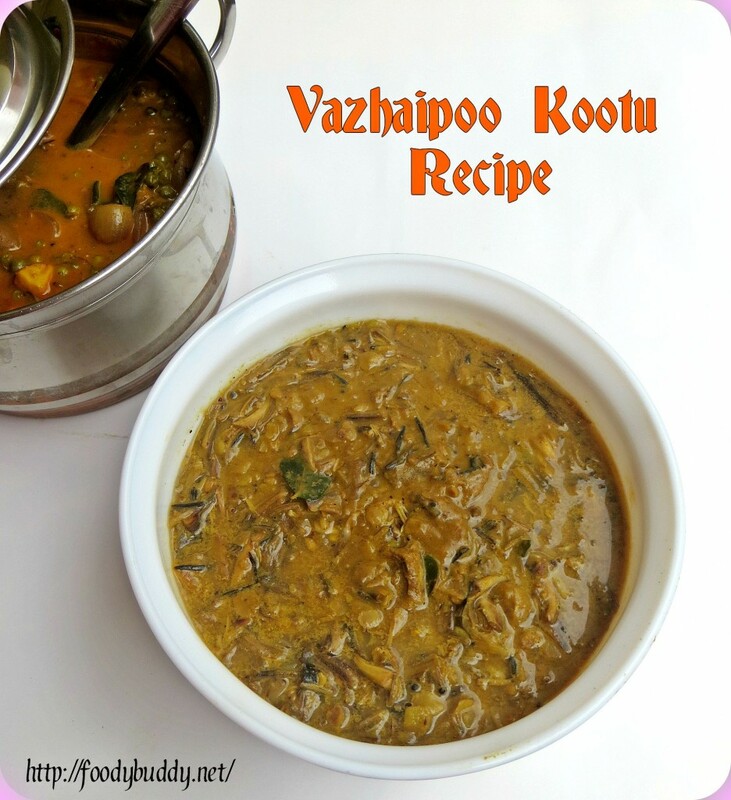 Try this vazhaipoo kootu recipe without coconut, if you are diet conscious. Being high in iron content, used to treat anaemia. Controls the excessive pain during menstrual cycle. Good medicine for stomach ulcer and dysentery. Rich in vitamin A, C and dietary fibre. To clean banana flower (vazhaipoo), apply some oil on both hands, take off the purple outer covering, remove the bunch of florets, repeat this step until you reach the centre of the blossom. After that, remove the stamen and small white cover at the base of each florets. This is how you have to clean each florets. In a pressure cooker, add banana florets, toor dal, oil, salt, chopped tomato, chopped onion, sambar powder and water. Cook it for 5-7 whistles. Open the lid, after pressure releases. Heat oil in a pan, when it is hot, add mustard seeds, red chillies, asafoetida and curry leaves, after it splutters, add the cooked dal, mix well. Check the salt. Hot and flavourful vazhaipoo kootu is ready to serve. It goes well with any spicy kulambhu like manathakali kulmabhu or milagu kuzhambhu. You can replace toor dal with moong dal or channa dal. Adjust spiciness according to your taste. You can also add green chillies in addition to red chillies.